What happened on June 7, 2014 for 100 in 1 Day Toronto? We took over 3 parking spaces and part of the sidewalk on Queen Street West in the block between Spadina Avenue and Soho Street. Hundreds of people stopped to enjoy hammocks, Muskoka chairs, board games, and just lying on the grass. We received universally positive feedback from participants and neighbouring businesses. People wanted to know when it would be happening again. What do you want to accomplish with the 2014 Vital Innovation Award from the Toronto Community Foundation? We will engage residents, businesses, and key stakeholders in a collaborative process to make the most of the street’s potential in all Queen Street’s neighbourhoods, from The Beach to Parkdale. What’s your vision for Queen Street? We want people to think of Queen Street as more than a way to get from A to B. 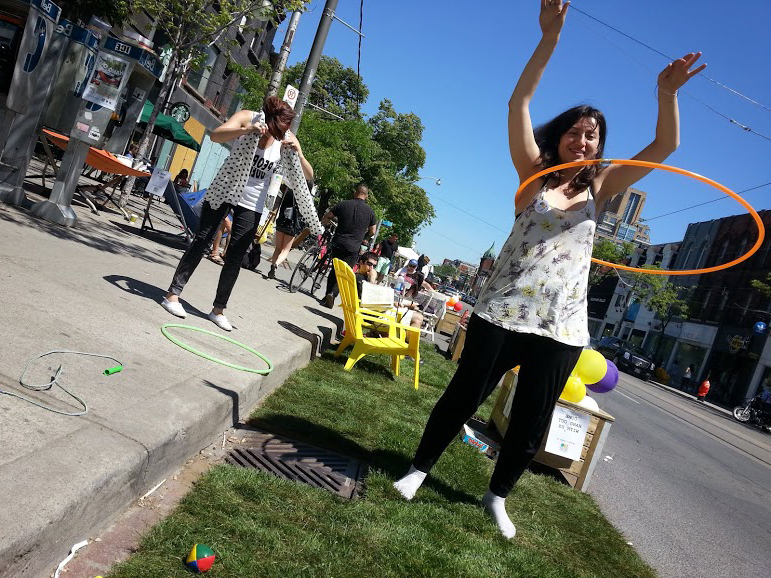 We want it to be a defining public space for all residents of Toronto. A Queen Street with public space that be used for reading, dancing, yoga, conversation, playing board games or quiet contemplation. Will business be negatively affected by reduced parking and/or car access? In one day, June 7, in only three parking spaces, hundreds of people stopped to enjoy a space that might otherwise have only been used by a dozen cars all day. In the conversations we’ve had with business owners on Queen Street West, so far, they recognize the enormous sales potential from thousands of people enjoying public space at their doorstep every day. We recognize that each neighbourhood of Queen Street West and Queen Street East is distinct with unique transit, vehicular, pedestrian and cycling challenges and opportunities. We will seek to engage, partner and collaborate with members of each of these residential, cultural and business communities as we move forward with The People’s Queen Street. I am a producer at radio station Newstalk1010 CFRB. We would like you to join us on-air today sometime between 2:00PM and 3:00PM – for about 10 Minutes to discuss your quest to make Queen Street car free.